A note: My first book will be out soon! Here’s an excerpt from one of the chapters. What was the first thing you ever had to sell? For me, it was Girl Scout cookies. I was ten years old, dressed in my distinctly unfashionable Girl Scout vest, skirt, and knee socks, walking along the side of the road listening to the gravel crunch under my sneakers. The sun beat down on our neighborhood, and I could smell the melting tar on the road. I was in a state of abject terror, my sweaty hands clutching a wrinkled order form. I didn’t even know the people whose porches I stood on and whose doorbells I was about to ring: how could I possibly ask them to buy something? I was just a kid who lived on their street. What right did I have to show up and offer something for sale? It turns out that this lesson from my past taught me almost everything I needed to know about how to use the right mindset when asking someone to take action. At the time, I didn’t realize that people love Girl Scout cookies. They want to buy them. They actually look forward to ordering them. Back then, I didn’t know any of that. If I had, I might have ended up being one of the top sellers in my troop. Instead, I was lucky if I could fill in the first ten lines of my order form each year. Our content — ultimately — has a business purpose. Oh sure, we’re writing to attract an audience and build trust. We want to inform and — if possible — entertain. But for our efforts to have a measurable effect on our businesses, we have to take that final step. We have to ask our readers to take action based on what they’ve read. And we have to sell them on the idea. That’s the job of your call to action. Your call to action is the part of your content where you’re going to ask the reader to do something. In this article, we’re going to talk about two components of your call to action: the verbal and the visual. But first, let’s talk psychology. What’s going through your head as you think about writing a call to action for your content? All common fears. Those are the kinds of thoughts I had when I was trying to sell Girl Scout cookies! There are two things happening here — and they’re in direct competition with one another. On one side there’s you, feeling embarrassed about making an offer. On the other side, there’s your audience — wanting to do business with you! How do we bridge that gap? It starts with confidence — your confidence. If you want to create an effective call to action, it should come from a place of knowing your offer is valuable, useful, and helpful to the customer. If you can’t honestly say that, work on improving your offer first. I want you to stand tall and have pride that you have something amazing to offer people. Something they’ll enjoy and benefit from. You owe it to your readers to craft a call to action that will make them want to try your product or service. To do this successfully, you’ll need to pay attention to two aspects: the verbal and the visual. Let’s start with the words first. Calls to action consist of two parts: the words used to make the offer (the verbal part) and the graphic treatment of the call to action (the visual part). The best calls to action are strong on both levels. They use the right words and combine them with a graphic treatment that makes the call to action stand out visually, so your reader stops and pays attention to it. When we talk about a call to action, we’re not referring to all the content on a sales page. Calls to action are a specific section of a larger piece of content. That content could be a sales page, but it could also be a blog post, About page, or your bio. The call to action is the place where you ask people to act on the information that comes before it. They’re usually about 100 words or less. And because the verbal part of your call to action is short, every word needs to count. There are three parts to a standard call to action: the headline, the offer copy, and the button or link. The headline: emphasize benefits, not features. The headline should reflect the specific benefits the reader will experience when they take action. This is an important marketing concept that trips up even the most experienced marketers. Your first impulse will be to talk about features, but effective calls to action talk about benefits. What’s the difference? Get Everyday Citrus Recipes, a 164-page ebook with 100 recipes for using oranges, grapefruits, tangerines, and clementines at every meal. Click here to buy. Bolster your immune system, protect your heart and eyes, and enjoy clearer skin while enjoying the taste of delicious citrus at every meal! Click to get healthy and delicious Everyday Citrus Recipes. These are specific benefits you can highlight in your headline and body copy. They’ll resonate with readers because they touch on what I like to call the “magic five” benefits: Health, Wealth, Relationships, Success, and Peace of Mind. Tell the reader how your offer’s features will benefit them specifically in one of those five ways and you can’t miss. The offer copy: be clear, not clever. As you write the copy that will go below your call to action headline, remember — you only have 100 or so words and each one must count. This isn’t the time to make a joke or use a clever play on words. Your reader is making an important decision, and you should be ultra clear about why they should take action. If they’re at all confused, they won’t take action. Once you’ve established the specific benefits of taking action, you can weave in features to your call to action. Your benefits will resonate with your readers on an emotional level. Weaving in features will help bring logic into the picture. Let’s use the same example. In the first sentence, we’re highlighting the benefits. In the second sentence, we’re backing it up with a mention of the features. It’s a powerful emotion + logic combination. Bolster your immune system, protect your heart and eyes, and enjoy clearer skin while enjoying the taste of delicious citrus! Click to buy Everyday Citrus Recipes — more than 100 recipes for using oranges, grapefruits, tangerines, and clementines at every meal. The button: “I want to ___.” At the end of your call to action, you’ll find a button or a link. This is the physical location on your page or in your email where you’re asking the reader to rise to the occasion and take action. It’s the moment of truth! Your button copy makes a difference. Please, please don’t wimp out and use the word “Submit” or “Buy” here. Your button or link copy is an opportunity to reinforce the benefits of your offer. Don’t miss out. To write this copy, I like to use the tip I learned from Joanna Wiebe from Copyhackers.com. Joanna recommends you put yourself in your readers’ shoes and think about the phrase “I want to ____” when writing your button copy. Fill in the blank with whatever words your reader might use to describe the benefit they’ll experience from taking action. You might wonder if writing a call to action is overkill for a blog post. For some pieces of content, a subtle call to action like “Share your favorite ways to use citrus in the comments section” will suffice. But a great piece of content deserves a stronger, more confident call to action. Why not ask people to sign up for your email list when you’ve given them a valuable piece of content? Why not tell them about your ebook or your services? Don’t be afraid to ask for an action at the end of every piece of content you create. You might think about it as a spectrum: on the low-commitment end of the spectrum, you may ask them to add a comment or click to read another piece of content on your site. And on the high-commitment end of the spectrum, you may ask them to buy a product or call to make an appointment. And remember, when you’ve got a great product to sell (like Girl Scout cookies) don’t be shy about making your offer. No matter where your call to action falls on the spectrum, people won’t act on it if they don’t see it. That’s what we’ll talk about next — how to make your call to action stand out visually. If a call to action is beautifully written but no one sees it, did it ever really happen? Calls to action, as we’ve talked about, are short — maybe 100 words at the most. And they usually “live” on a page with hundreds — sometimes thousands — of other words. Your little call to action is outnumbered — it’s surrounded by your content. How can you ensure it gets seen? The key to creating a call to action that doesn’t get overlooked is to make it visually different from all the other words on your page. It needs a unique graphic treatment that will stop readers in their tracks and tell them, “This is something you should pay attention to.” You don’t have to be a designer to make your call to action stand out. Here are the areas to work on. Use a different color palette. Grab a color wheel, and look at the colors on your website. (Get a free color wheel at Big Brand System.) For your call-to-action text, background color, or border (more on this below), use colors that are on the opposite side of the color wheel from the colors people usually see on your site. If your site is all reds and oranges, use blues and greens for your call to action. If it’s blues and purples, use gold and orange in your call to action. You may not like how it looks at first. It’s going to stick out like a sore thumb! But that’s exactly the effect you want. Make it larger and bolder. Look at the size of your body text. For your call-to-action headline, use at least subhead-size text. For the body copy where you share details of your offer, consider using larger-than-usual text, or making it bold. Warning: it will not be subtle and beautiful like the rest of your page. And that’s a plus. Surround it with space. Be careful not to bury your call to action inside your page copy. Add space above, below, and to the left and right of your call to action so it floats in the middle of open white space. Doing this will put your call to action on a visual pedestal and help it stand out. Use a background or a border. Want to really draw attention to your call to action visually? Add a border or background color to this part of your content. This is a subtle but effective visual trick: by surrounding your call to action with a different color, you’re saying, “This is something different: pay attention.” Use your color wheel to choose colors that are on the opposite side of the color wheel from what people usually see on your site. Your text needs to be readable, so don’t run it on an overly bright or too dark background. Instead, use pale versions of colors. Instead of navy blue, use a light blue tint. Instead of orange, use a light peach tint. Repeat your call to action, especially if your page is long. If your page is quite long (1,500 words or more), don’t be afraid to repeat your call to action. Remember, people scan text on the web. On a long page, if you don’t feature your call to action more than once, many people will miss it. They’ll never scan all the way to the bottom to see your visually prominent call to action sitting like a beacon at the bottom of your page. Call them to action — and don’t be afraid to call them more than once. Think about your call to action like an on-site salesperson who’s representing the best of what your business offers. Spend time making this important element stand out both verbally and visually. It may seem like a lot of work, but your call to action truly is where business happens! Take care to ensure it’s as strong and convincing as it can be so it will work for you day and night, drawing prospects and customers to your business. Wise owl art by the amazing D.J. Billings. Previous article: Are One-on-One Connections the Key to Jumpstarting Your Online Business? Great post pamela. You went into very little details and explain all the details. But comparison of different call to action would make it little better. Well overall it was very useful. CTA is important that we have already known it. But, how to use it perfectly we lack a knowledge of it. Thanks a ton to copyblogger to share the views and techniques among us. 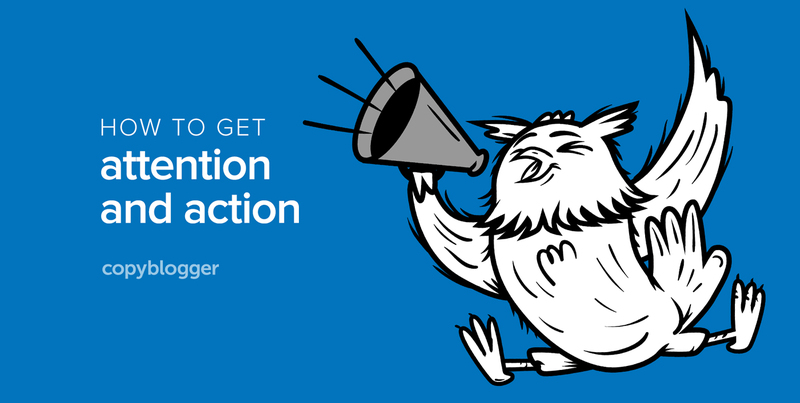 These are some great tips on how to make the most of your calls to action. You want your calls to action to make the reader want to engage with your offer. This is why I agree that making them stand out is important. You also share good advice on how to promote the benefits of the offer. Thanks for sharing Pamela! Great post Pamela, I look forward to getting to read the rest of your book! Thanks for the post Pamela. You touched on multiple details and explain all of them very well. Now I have some more studying to do regarding different call to action. Thanks again for the useful information. Call to Actions plays major role in traffic conversion. Here conversions means not only sales but these are the various actions that you want user to opt, for example subscribe, download, read more etc. Using CTA is in affecting manner is significant in fascinating users. Your guide definitely helps in this. Thanks for the post. Great article.. I think a good call to action is vital actually to traffic conversion. But for some reason i never seem to get it right on my website. I have no idea what i am doing wrong..
What a great post. I love the Girl Scout cookies sales story. I had the same experience. I hated every minute of going door-to-door. I was so embarrassed! Little did I know. And it’s amazing how back then we COULD go door-to-door and the only thing we feared was the sales pitch (or lack of one). My call to action is exactly reversed of what you recommend – so I’m going to change it. Thanks for the advise. I remember that girl scout cookie terror. After reading this, I realize I am still wearing that uniform with the feelings that went with it. I’ll be reading this one over and over again.